I posted about the Great Eyeliner Crisis of 2007 over six months ago on a WFMW Backwards Edition. Several of you suggested I try waterproof liquid eyeliner. And my life has been changed. Or, more specifically, the part of my life that involves my eyelids. For the first time ever I'm wearing eyeliner without doing raccoon eyes, even on days I wear my contacts. No smudging! And I've even been using a cheap brand (Maybelline) with great results. It's taken me a few months to get good at applying it. I had a few days of looking like Ozzy Osbourne before I figured it out. The real key is to apply it not by painting it in a straight line, but applying it a series of tiny little dots. The line goes on thinner that way. I thought about taking a picture of my eye to show you the results, but then I decided that would be the weirdest thing I've ever done in my life. So I reconsidered. Have a WFMW tip you'd like to share? Leave your link below. First-timers, please read through the guidelines. 3. Land of Lovings - stop the fighting! 41. Kirsty @ Momedy -Weight loss "Magic"
I've never been able to wear this stuff without looking like night of the living dead an hour later. I can't wait to try the tip! No, so not weird. In fact helpful. Series of little dots? How does that work? Posting a picture of your eye would be the weirdest thing you ever did in your life? In that case, I really think you need to post a picture! Thanks for the tip. I never wear eye makeup because of the contact lens/raccoon eye issues, so this gives me some hope. Thanks for the great tip...I'm going to try it because I hate the look of regular eyeliner, and the tiny dots sound like they might actually work. Our tips always seem to be related! Thanks! I do really, really need the picture! Oh please do the picture! Can you do pictures DURING so I can see the dots? I've tried liquid eyeliner before and I always look like a scary clown. I can't do liquid. I use powder with a really fine slanted brush and get really close to the lash line. I use the dots when I wear my fake eyelashes. It helps not to have a line of glue. If I mess up it's easier to peel off. I've tried liquid and it did not work for me, but your little dot technique gives me hope. I may try it gain. Maybe. Mrs. N.
I love liquid eyeliner! I've used it for at least 10 years! It does take a little practice, though. I admire you if the weirdest thing you have done in your life is just taking a photo of your eye! liquid eyeliner. love/hate relationship with it. glad it works for you! Almay has awesome liquid liner! It's easy to put on fast, and it stays, too! I've only recently decided this, as Urban Decay has been my favorite, so I thought I'd share. Thanks - I will give it a go. Hi! I"m sorry to link twice! Thought the first time didn't go thru and forgot to mention my topic/tip! Please delete the first one! Thanks! OH, and I checked for the post at 12:30 p.m. my time, thinking I'd be one of the first!!! HA! 100 ahead of me already!!?? OK, I will try the dots. I am so tired of smudges. I did get a new liquid eyeliner from Avon, but haven't done so well trying to draw a straight line!! Liquid eyeliner scares me too, although, I know how good it looks. I will have to try it, some day, I will. Alright. If you say it works with the dots, I'll try it. Because I put some on about a month ago to the complete horror of my 13 & 11 year old daughters. From the backseat you could hear the gasping and whispers. It was worse than 7th grade! Even my husband gave the ol', "whatssup with your eyes?" I might try again, but only right before I can wash my face because I don't think I can stand the judgement. Little dots? I have never thought about that before, but it makes perfect since. Thanks for the tip. i ahven't tried liquid since high school, and I couldn't do it then. But I think I will try again! I'll try it..........thanks for the tip, however it would have been cool to see the picture of your eye! I've been using a cheap N.Y.C. mascara with great success. I too learned that the trick was little dots and not one big line. Who knew? Oh, and I came over today via a comment you left at Like Merchant Ships. I've always got spoons in my sandbox too! I've always been weary of liquid eyeliner. 80's pics of me may prove otherwise, but I am more of a pencil girl. I am definitely going to try that! When my boys give me "the look" I know that I have that raccoon look. I was taught by my sis in law on how to apply liquid eye liner when I was about 16-17 years old. It took a long time to get it right but now I put on the eye liner like nothing. It lasts pretty much all day too. I love it. My favorite is from Loreal or Cover Girl. It also needs to be the brush kind, not the foam tip. I am an idiot. I put in my link three times, the first two incorrectly. Please delete them, I am not trying to spam you or anything, I am simply inept. Sorry!!! Hi Shannon....long time huh? (I used to be Queen Beth). Thought I'd give your carnival a try. Good stuff here! Great tip! I've never had any luck with the liquid stuff. Well, or makeup of any kind really... lol. I can't imagine little dots appearing as a smooth line. I would also love to see a picture so I don't have to rely on the image of dotted eyeliner in my head! Ummm. I'm a goober and made a type-oh. could you delete #228. I'm sorry so sorry. :( Thanks. Sorry my first link was wrong. I'm a huge liquid eyeliner fan - it's the only kind that works for me!! I'm glad you've had luck, I never had the patience to make it past the Ozzy look. I cried one day while trying it out and I gave KISS a run for their money. I have always been too scared to try the liquid eyeliner. I may just give it a try now. Ok, we will try that. Linked to the post, not to the front page of the blog. If that doesnt work, i dont know what I am doing wrong! WATERPROOF liquid eyeliner! What a smart idea - whenever I wear liquid eyeliner, I look like a showgirl (a fat one) on a bender. I have never tried liquid eye liner for fear of the raccoon eyes. Waterproof eye liner and the little dot technique sound like excellent ideas. Anything that comes that near to my eye gives me the quivers! I rub my eyes soooo much without realizing it that mascara gives me fits... not sure about liquid eyeliner. Check out my tip: all natural deodorant! Thanks, Shannon! Always so much fun. Can't wait to hear about how you lost 20 pounds!! Way to go! p.s. ditto to Becky Day and inadvertently added my link twice - got the topic the second round. feel free to delete the excess and Thanx for WFMW! Great stuff! Wow. Liquid eyeliner. That would take a lot of guts for me. I barely can mentally handle the 'fake' stuff. :) I may need to try it. It could provide that daily dose of drama I need so much. OH! It worked! I have been trying liquid eyeliner for the first time and I could never get it right. I tried your way this morning and it is perfect! THANK YOU!!! I believe this is my first visit here- I had to come because so many people refer to this blog on their posts. I can see why! As far as liquid eyeliner goes- I have been using it for years. I have used it through times when people said it's "out." All I know is that when I don't use it, everyone asks me if I am feeling okay. 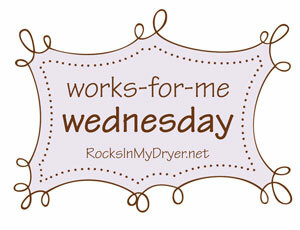 I doubt I will have any handy tips for Wednesdays posts- but I will make it a point to stop by and enjoy. Have you ever had a WFMW that was all about pregnancy and labor? I could REALLY use that. Maybe it's too specific, but I wanted to ask.